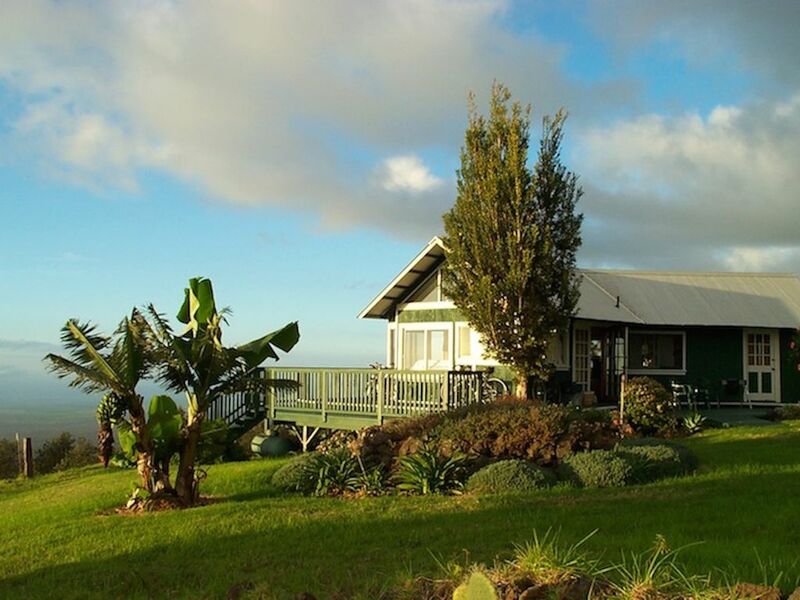 Willkommen im Star Lookout, einem magischen Ferienhaus in Mauis Upcountry. Erleben Sie einen Hauch von "Old Hawaii" in unserer ruhigen, erholsamen Barsch mit Privatsphäre, weiten Ausblicken, herrlichen Sonnenuntergängen und Unmengen von Sternen. Wir befinden uns in 622 Thompson Road, Kula, HI 96790. Der Star Lookout ist der perfekte Rückzugsort für Naturliebhaber, Sterngucker, Schriftsteller, Outdoor-Enthusiasten, Flitterwochen und, naja, für jeden, der sich von allem erholen möchte. Das Star Lookout ist eine Eins-in-einer-Million-Immobilie mit unverbaubarem Blick auf beide Ufer von Maui. Im Süden die Gemeinde Kihei und Einblicke in die Nachbarinseln. Im Norden, Kahului und Blick auf Nordufer Strände und Zuckerrohrfelder. Das gesamte Anwesen ist von Weiden und Felsvorsprüngen umgeben. Wir sind ab April 2009 ein zugelassenes, legales Ferienhaus. Für Hilfe rufen Sie bitte 907-250-2364. Zwei neu renovierte Badezimmer mit ebenerdiger Dusche. Seife (keine anderen Toilettenartikel) und Handtücher werden gestellt. 30 Minuten von Weltklasse-Windsurfen Strände. Upcountry Maui ist eine Primzahl Rennrad Land! Der perfekte Start für eine Fahrt bis Haleakala (7.000 'Klettern), Ulupalakua Winery-Fahrt und einige epische 100-milers. The cottage is so charming with a spectacular view! Garden was in bloom and a stroll down the lane with the mist coming down the mountain was magical! The caretaker was always there to help and was very friendly. We will definitely be back! 10 Star Rating if I Could! When I arrived at this property, I was so stunned by it's beauty that I checked my phone 4x to make sure I had the right property! I have stayed at many rentals in the past few years and this rental was the best one ever!!! The owners have taken such care to make this cottage special. The exterior is charming. The landscaping is beautiful. The deck is beautifully done. The interior....where do I begin? So charming. The bed is so comfortable. The way the sun shines thru the bedroom windows make me feel like a queen. At night I can see the gorgeous skyline from my bed. I was so excited to see that there were cows and sheep. They were such a treat for me because I'm not usually around farm animals. I felt like I was on a Hawaiian safari! The bathroom I had beautiful fixtures. The shower is huge. The towels are nice and fluffy. I thoroughly enjoyed sitting on the deck alone at night gazing at the stars and hearing one of the animals quietly exhaling. This was true serenity. I had a lovely walk on the road. It is peaceful. I saw horses on the hill and morning glories climbing stone walls. All I can say is, the pics don't do this place justice. It is a very special, serene, breathtaking place to be. Thank you Janice for sharing this gem in Kula. Your beautiful place has made my annual Maui trip extra special. I will remember this place forever. I hope I can be here again next year! WE come here year after year and we can't wait to come again! Thanks Janice for sharing your amazing vacation rental.... We love it! This lovely cottage with a world-class view is the perfect escape from everyday life and from the tourist glitz. The cabin is private, cozy, quiet, and thoughtfully arranged and supplied. If you can tear yourself away from the serenity it’s well located to explore upcountry and to take the back road to Hana. We would stay here again in a heartbeat. We’re so happy that you enjoyed your stay. Hope to see you again! We had a great stay at the Star Lookout and really enjoyed its location in Upcountry Maui. The view from the cabin is spectacular and the cabin itself features most all of the amenities you could want in a rental. Overall, it was clean, comfortable, and homey.